The Lead Designer of Shadow of Mordor demonstrates the nemesis system and shows a story mission. Peter and Justin swing by the GameSpot stage to discuss the latest news from Nintendo at PAX Prime. Chris and Mary go over some of the special abilities that Claptrap brings to Borderlands: The Pre-Sequel. Abilities like Rubber Ducky. Chris invited Mikey Neumann and Kris Straub to talk about the myriad of projects they are involved in, from comics to movie reviews. The first beta for Mighty No. 9 will start tomorrow, the game's creator Keiji Inafune announced today at his PAX 2014 panel. Kickstarter backers who pledged at the tiers that gave them access to the beta ($80 or more) will be able to download a build of the game that includes only the fifth level. However, over the next few weeks, the Mighty No. 9 development team will keep adding more content until beta testers will have access to a total of three levels. Inafune also revealed that all Mighty No. 9 backers will get a free copy of Mighty Gunvolt, a 8-bit reimagining of the 2D action platformer Azure Striker Gunvolt developed by Inti Creates, which Inafune worked on as an "honorary action director." Fans who were lucky enough to attend Inafune's panel received a free copy of Mighty No. 9, free access to the beta, as well as a free copy of Mighty Gunvolt. During the panel, Inafune said the team has spent the last year working on Mighty No. 9's core mechanics, but that they already completed work on a few key assets, abilities, and bosses. Inafune also showed a short video demonstrating a competitive online race mode for Mighty No. 9, though he said that he hasn't decided if it will make it into the final game. Mighty No. 9 is becoming a reality thanks to an overwhelmingly successful Kickstarter campaign, which rocketed past its $900,000 goal, ending with $3.8 million last year. The side-scrolling action game is being worked on by Inafune himself and a team of designers at his studio, Comcept. The final game is expected to launch by April 2015 for PC, Wii U, Xbox 360, PlayStation 3, Xbox One, PlayStation 4, PlayStation Vita, and 3DS. Sam Robinson takes us through story and level design behind the sequel to Stealth Inc, coming exclusively to the Wii U. World of Warcraft is slowing down, but it had an amazing run since it launched in 2004. Hearthstone: Heroes of Warcraft, Blizzard hopes, will enjoy the same kind of longevity. According to Hearthstone producer Yong Woo, the desire to keep the game running for a long time motivates Blizzard to price items in the free-to-play game fairly. "Universally we’ve been getting feedback that our pricing is very generous," Yong told IGN in an interview. "To us, that’s important. For us, we’re here for the long run. We’re not here to make a quick buck. I want to be playing and working on Hearthstone 10 years from now and from that end, instead of focusing on maximising immediate profit, Hearthstone is really about being able to play it how you want to." Production director for Hearthstone Jason Chayes reiterated the sentiment in an interview with Games Industry International. "We talked about this idea of white hat black hat from Westerns, and for us one of the goals we set for ourselves was that we wanted to do microtransactions with a white hat," he said. "When Blizzard approaches a game it's with the intention of making something that's going to be around not for a month or two or a year or two but something that we're really into for the long haul. A game that we plan to support for many many years to come, and that's certainly the case with Hearthstone." Since it launched the beta, the group within Blizzard that created Hearthstone, Team 5, has grown from 15 people to more than 30. It's now working on responding to player feedback and creating new content to keep players engaged. The most significant content added to the game so far was the single-player expansion Curse of Naxxramas, which released on July 22. For more on Hearthstone, be sure to check out our previous coverage. 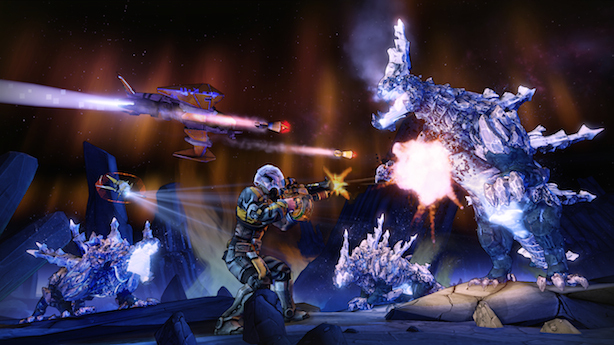 In case you were worried about running out of loot to hoard in Borderlands: The Pre-Sequel, a $30 season pass has been announced for Gearbox and 2K Australia's upcoming shootout on Pandora's moon. The pass will last for four additional content packs, which a related press release notes will include "new characters, missions and experiences." Vault hunters wary of preemptive bulk DLC purchases will still be able to pick up the packs individually as they release for $9.99 apiece. As is the modern custom, bonus content called the Shock Drop Slaughter Pit can also be earned by pre-ordering The Pre-Sequel from select retailers. Those waiting on holiday sales to stock up on this year's remaining games won't miss out on the Slaughter Pit though, as the press release adds it will be available for purchase later on. Borderlands: The Pre-Sequel season pass, pre-order Slaughter Pit announced originally appeared on Joystiq on Sun, 31 Aug 2014 17:30:00 EST. Please see our terms for use of feeds.